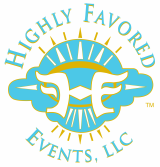 ​info @highlyfavoredevents.com and we can get you set up. In addition to the many events that we plan for clients each year, we also produce The Shades Of Beauty Expo in both Arkansas and Minnesota. It is an event designed to inspire women and girls of color to love who they are unconditionally from the inside - out. We provide workshops, demonstrations, prizes, and free health screenings as well as showcase woman- and minority-owned small businesses. It is our desire that attendees of all ages will leave equipped to take control of their health, inspired to embrace their unique beauty, and committed to empowering others.